The President of the Weed Science Society of Nigeria (WSSN), Professor Nuhu Gworgwor, has observed that the world population is at the risk of malnutrition and starvation, if factors militating against crop production were not addressed and agricultural production increased, to meet the world’s population demand. Professor Gworgwor gave the scary warning at the just-concluded 39th Annual Conference of the Society, titled “Restrategising Weed Management for the Attainment of Food Security and Environmental Sustainability”, hosted by the Federal University of Agriculture, Abeokuta (FUNAAB). Professor Gworgwor, who pointed out that the world’s population currently stands at 7 billion, noted that weeds, pests and diseases were globally responsible for potential crop losses at the rate of 34%, 18% and 16%, respectively. He reiterated the warning by the Food and Agricultural Organization of the United Nations, of the need for global food production to increase by over 40% by 2030 and 70% by 2050. Positing that the mandates of the Society included tackling of the perennial problems of weed management, safe-guarding the environment and ensuring food security for the nation, the President called for government’s support through the provision of adequate research infrastructure and an unhindered access to research findings. According to him, with the right tools in place, the Society would be able to, “enhance the productivity of the Nigerian farmers in manners which are sustainable, making farming profitable’’. Earlier in his Welcome Address, the Vice-Chancellor, Professor Oluwafemi Olaiya Balogun, commended the efforts of the Society with an assurance of the University’s continued support towards the development of Weed Science. Professor Balogun noted that the theme of the Conference was auspicious to the nation and the University in particular, as the University’s mandate was rooted in food security and environmental sustainability. Professor Balogun, who was represented by the Deputy Vice-Chancellor (Development), Professor Kolawole Salako, added that “these are important issues in our country if government is to ensure a stable socio-economic condition. Once a nation is able to solve her food problems and provide basic amenities, the citizenry would then be able to contribute positively to its economic growth”. 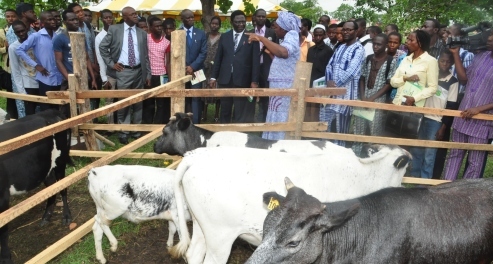 The Vice-Chancellor further revealed that, “as part of the efforts of the University to enhance agricultural productivity, it has established the Institute of Food Security, Environmental Resources and Agricultural Research (IFSERAR); Agricultural Media Resources and Extension Centre (AMREC); the Teaching and Research Farm Directorate (TREFAD) and the Graduate Farmers’ Employment Scheme (GRADFES)”. Professor Balogun tasked the Society to take advantage of the Conference to further brainstorm on efficient weed management techniques without losing sight of the desire for environmental sustainability.